Youth brands are swiftly launching damage limitation exercises after coming under scrutiny following the riots and looting across England last week. Brands including Levi's and Nike denied suggestions that they were paying the price of flirting with images of youthful rebellion, but several youth brands are attempting to reconnect their offerings with sportspeople and even with the people who cleaned up after the protests. In a Daily Mail column on Monday, Janet Street-Porter wrote that 'even mainstream brands such as Levi's promote the notion of confrontation as hip'. Writing for PRWeek, Instinct PR founder Jonathan Kirkby has argued that brands must now become 'more sensitive' with their PR and marketing, warning against using imagery and ideas that could be interpreted as 'encouraging a rebellious attitude'. Levi's pulled cinema and Facebook adverts last week for its Go Forth range, which featured a young man squaring up to riot police while a voiceover said 'you're marvellous'. Although Levi's declined to discuss how it was moving its brand on following the riots, a statement given to PRWeek claimed that the advert was 'in the spirit of positive action and optimism'. A Nike spokesman denied that the brand had flirted with dangerous imagery, although earlier this year it replaced a line of shirts that read 'Dope', 'Get High' and 'Ride Pipe' following complaints that they promoted drug use. Hinting that Nike was likely to refocus its comms and marketing strategy to emphasise its relationship with elite sportspeople, the spokesman insisted 'sports values have always inspired our campaigns and brand statements'. London 2012 Olympics tier one sponsor Adidas has used controversial rappers Snoop Dogg and Big Sean to promote the brand. Adidas head of PR Sarah Gower declined to comment, but a previous statement said the riots 'go against everything we stand for'. PRWeek also contacted JD Sports group marketing director Stephen White for comment, but he failed to respond. Foot Locker declined to comment as 'a matter of corporate policy'. Levi's was forced to pull an ad featuring a young man squaring up to riot police, following a public outcry that it glorified riots. Nike had a store hit in Manchester and its products were targeted in other stores by youths. 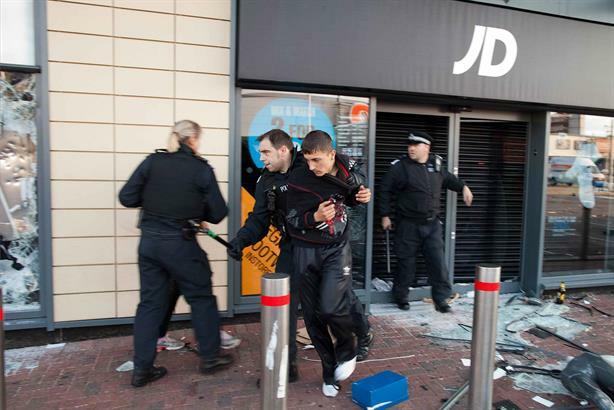 JD Sports suffered as young rioters struck 30 of its stores - at a cost of more than £10m in clean-up work and lost stock. BlackBerry was identified as the smartphone of choice for teenage rioters and its instant messaging service BBM was reportedly used to organise disruption. Adidas clothing featured in many of the media photographs of the riots. Will brands find a safer 'dangerous', or recognise the contribution of young people to society? Outwardly brands will be looking to change their marketing, inwardly possibly not. Every crisis will have an advantage - any marketer will come back with a campaign to deal with the news and also look at where things are likely to be in two years' time. They won't want to throw it away. They will be keeping their heads down, but I think they will be playing with two packs of cards. Strategically, there is an advantage for a brand to have a bold position. If you could find a 'dangerous' that's not about looting and rioting, then there's a really interesting creative challenge for any brand that wants to have a difference in its marketplace. It's a huge opportunity for some creative thinking and experiential activity. It will be underground and among a network of advocates. In light of the riots, brands need to be more sensitive to the overall message they portray when marketing, in particular to youths. New PR and marketing campaigns need to be aware of their styling, messaging and the product placement in order not to encourage a rebellious attitude with certain poses and street scenes, as this could influence the audience negatively. My advice post-riot would be for brands to invest in role models such as Kanye West and David Beckham, who are conscious of emphasising positive attitudes through their lifestyle, career and attitude. Brands should see them as an opportunity to encourage their captive audience with sponsored apprenticeships or career opportunities, and recognising the youths who are giving something back to society.